What do you see in this photograph? In a so called massive show of strength, whatever that means, a united opposition flocked to Bengaluru to take part in the oath taking ceremony of H D Kumaraswami. No, I am not questioning why one would want to invite so many losers on a day that holds some kind of significance for oneself. Nothing wrong in that and it is a personal choice. As is, Kumaraswami is a practicing prosti.. err politician, so that should be fine. It has been a tradition for quite a while in our political discourse where leaders had invited their political allies and friends, sometimes even foes, to one political function or the other. Nothing new or wrong if Kumaraswami invites his allies, present and possible future, to celebrate his accidental ‘CMship’. But to call the gathering a massive show of strength is stretching it little too far. Even farther from the ground realities is the claim that, this group of desperate political parties and leaders would present a strong opposition to Narendra Modi and BJP in 2019 general elections. I am not sure if they are hallucinating or bluffing themselves, but to project 2019 election outcome as simplistic as they are, it is nothing but plain laughable. 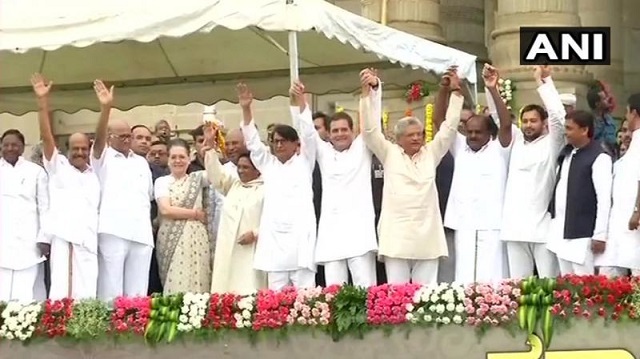 I would rather call those, both within the political sphere and the Congress nurtured ecosystem alike, who believe this depleted lot will challenge the BJP, a bunch of daydreamers. But before that, would even this bunch of failed leaders manage to stay in a herd till 2019 general elections? Let’s see. Before we move ahead; I started the post by asking – what do you see in this photograph? Let me answer what I see here. I see a bunch of leaders who are desperate for their survival, both politically and financially. Post 2014, most of these leaders are seeing their parties on a downward spiral free-fall. Both their political as well as financial savings have reduced to naught. A recent report on Congress’s financial crisis says a lot about the challenges Congress party faces to even remain afloat, much less giving a fight. Keep it in mind, this is the situation of a big national political party that has looted the nation for close to 65 years. How severe is the situation for smaller regional parties would be today needs no guess work. Most have a dried coffers with many even facing challenges to mobilize their leaders/carders to different parts during an election. If the situation continues as is for another five years then most of these regional satraps would wind up their political business and disappear. It would simply become unsustainable for them. As I mentioned in my last post – Karnataka is the last ATM for the Congress party. Perhaps why the Congress gleefully agreed to give away the CM post to Kumaraswamy without any objection. Somehow save the last money source. Protection of the last ‘milch cow’ is paramount. Personal pride and other similar nonsense to that effect can wait. Other leaders see light at the end of the tunnel and hope, they too could save their coffers from drying by remaining united. May be, the last hope. Moving ahead; what realistic feasibility such a rainbow coalition holds, as far as toppling the Modi government in 2019 is concerned? Many in our fake intelligentsia are going gung-ho since yesterday. Most of the leaders of these state satraps and their spokespersons were equally euphoric. They called it a show of strength. Show of strength to whom and what? Strength is when you have something credible to offer as an alternative. What this congregation of failed losers would offer to the voters in particular and the nation in general? I didn't hear, not even a single leader, speaking out the idea behind such a coalition and what are the agendas that binds them all. Most had just one thing to say – we want to keep BJP and Modi out. Really? Is this what their long term vision is? Is this what they would offer to the voters in their manifesto? Here are a bunch of losers who have nothing as their apparition except pathological Modi hatred. They have nothing common amongst each other except their respective anxiety to stay relevant. And yet, these losers shamelessly flaunt their herd of desperation as ‘show of strength’. Look at the picture again. The most notable moron in the herd is Sitaram Yechury. What a certain Sitaram Yechury would bring to the table when he never had done anything good for the nation till now? Throughout his entire political career he remained true to what he always was – worthless. I haven’t seen a bigger political buffoon than him. No, even Rahul Gandhi is no match for this worthless character. He is worthless to such an extent that he never could manage to win a single election in his entire life. What value he would add to the coalition when even his own rejected him to head the politburo? What value his equally worthless party would add even? Since last four years the left have lost everything that they had since independence. Even they lost Tripura recently, and they lost it very badly too. Voters savagely threw them out of the state. In fact they have their credence at such a dismal low that their candidates are losing deposit wherever they are contesting. Even scarier is the history of political losses that CPI(M) carries. In the past whenever the left were thrown out they literally were wiped out permanently. At this rate the left would be crawling on the floor by the time 2019 general elections are here. Even more interesting is the prospect of the left joining their hands with Mamata Banarjee. Does that even look feasible? Left has nothing to lose and they may agree to a patch with TMC out of desperation but what about MB? Why would she lose out on her seats to left in a seat sharing arrangement? If at all she does then she would bargain for no less than the PM’s post in exchange of that. The first PM clement in the group right there. How many in that thug’s congregation would agree to this proposal? What was Mayawati doing there in the group is beyond me. She doesn’t have a single representation in the Loksabha as of today. Anything to go by, her prospects for 2019 aren’t very bright either. What value this loser would add? A thoroughly corrupt politician that she is, she has only nuisance factor to offer, nothing else. She is another of the worthless politicians who have made a lot of money by just playing their caste cards. No vision, no foresight and no credentials, except their caste. That said, I won’t be surprised if she would be second in line after MB in dreaming for the PM’s position. Even more interesting is the prospect of a SP-BSP patch up for the coalition to work. How feasible it looks? Why Akhilesh Yadav would play the loose ball here knowing very well that he may have to do all the sacrifice in the seat sharing model? Not that AY is any better positioned. His own stake in the state polity has depleted considerably post 2014. There isn’t any Mulayam Yadav either to bail him out. At this juncture when SP has only 5 seats in the Loksabha, it simply can’t afford to get stagnant or worse lose few prospective seats to its arch rival BSP. Same is the case as West-Bengal. Like the left in WB, worthless Mayawati may agree as she has got nothing to lose but a certain Akhilesh Yadav, barely hanging from the skin of his teeth in his quest for survival, may not agree. I don’t see any reason even why he should. Like MB, if at all AY does the sacrifice, he won’t do it without being paid back heftily. May be just another one in the lot dreaming with his PM aspiration, who knows. The second biggest worthless in the lot after Sitaram Yechury is Ajit Singh. I don’t know how this routine failure has survived so long in our political discourse. Last time when there was an attempt at a fourth front in 1988, Ajit Singh was there on the stage, and pretty much sporting a similar pose. And it is today but Ajit Singh hasn’t moved an inch from where he was in 1988. He is still stuck there with his perpetual incapability as a leader. Between 1988 and 2018 Ajit Singh has absolutely nothing as his achievement/s. Not that he ever had any achievements to begin with. No wonder why I call him worthless. In fact he has become irrelevant a long time back. Barring his naked display of opportunism here-and-there like a circus clown, I don’t remember if I ever have noticed him anywhere around serious political manoeuvres in recent times. I doubt if anyone would be caring two hoots for this seasoned loser either. Honestly, I don’t even remember his political outfit’s name, not that I could care less. What value he would add to the so called show of strength? What strength a loser like AS carry? Closely competing with Ajit Singh for the second spot in the race of worthlessness is Tejaswi Yadav; another vulture in this clown’s congregation. And you may ask, why second? Because Sitaram Yechury is the undisputed winner in worthlessness already. Coming back to the topic; an entity like TY always reminds you why education is necessary. Few days back he was demanding the present Bihar government be dissolved and his party should be asked to form the government since he holds the maximum numbers as the single largest party. That was a laugh riot moment. By the way, how many seats RJD has in Loksabha today? What are even the future prospects in 2019 elections, now that the corrupt Lalu is packed behind the bars? Only a fool like TY can believe that the seats RJD won in last state elections because people wanted a corrupt like Lalu to be back at the helm. It was a desperate Nitish Kumar and his desperation for survival that made him reach out to Lalu for an alliance. With no options in hand NK had to shed many of JD(U) sure shot seats to RJD. Roughly 40-45 seats of JD(U) were gifted by NK to Lalu as part of the arrangement. Those who voted for TY’s party were largely JD(U) voters. Now that BJP and JD(U) are back, RJD getting wiped out completely is a real possibility. So what Tejaswi Yadav is dreaming about? The PM’s post? In fact the unholy association of Nitish Kumar and Lalu of two years should serve as a mirror for the clowns who went about their so called show of strength in Bengaluru. The association didn’t last long and the proposed association of all kind of losers won’t survive much longer either. It simply won’t because there isn’t any minimum common agenda amongst the constituents to stay glued longer. Just hating Modi won’t cut the ice for a long duration when they themselves, each on his/her own term, have no credibility to stay afloat. Most of these are corrupt to the core and severely lack any vision for the nation. Had they anything for the nation to offer, they would have already spelt it out. But all that they are blabbering today – we want BJP and Modi out of power. Another joke of an individual in the group that made me wonder was Sharad Pawar. What was he doing there? What are his specific stakes? NCP as a party has got nothing to their credit except corruption. In fact the fundamental reason why NCP was established was to serve their inner greed for loot money. Post 2014 NCP is a depleted lot in the state of Maharashtra. The party carders are openly seen spreading filth against the party and its leadership. The core vote base of NCP are thoroughly disappointed with SP and down. Changan Bhujbal is languishing behind the bars and anytime Ajit Pawar would be bundled like wool and tossed inside another jail. SP should thank his stars that he holds 6 Loksabha seats till now. He should also thank his stars that he hasn’t been sent to jail yet. Many in his party are jumping the ship knowing it is a sinking one. In the recently concluded Maharashtra by polls, NCP even struggled to mobilize enough carders to campaign. Like TY and RJD, getting wiped out completely from the state is a real possibility for SP and NCP. In event of this what Sharad Pawar would offer here? What kind of strength SP would lend to this failure’s congregation? Nothing, absolutely nothing. Not to forget, no one can be as opportunistic as Sharad Pawar is. I won’t be surprised if Ramvilas Paswan and Ajit Singh mastered the art from Sharad Pawar himself. Glaring disjoint in the ‘show of strength’ cabal was the absence of Naveen Pattnaik, KCR and Arvind Kejriwal. Unlike the previous instances where Naveen Pattnaik couldn’t make it, he didn’t even sent any party member as his representative. NP has his own set of problems, first being, a resurgent BJP in the state breathing down his neck. For last 5 years NP’s policy has been – equal distance from BJP and Congress. At the worst people of Odisha wouldn’t mind much if BJD associates itself to BJP because they had a lengthy partnership till recently. NP was winning convincingly even during that period. I am sure NP is too smart to take a chance by sharing the same stage with Congress. Being from the state, I can vouch, people of Odisha hate the Congress party no end. Precisely the reason why the party was savagely mauled by the voters. The mauling was so severe that, it is 18 years and Congress never could rise from that. It is too much a risk for NP to make a blunder in going with Congress in the general elections. It would impact the state election, which is held parallel to the general elections. KCR refused to join the party because he is strongly against being seen hobnobbing with Congress. In fact Congress has become a ‘Panauti’, a pariah for many political parties. Whoever has joined hands with Congress in the past, he/she has got ruined in no time. There are plenty of examples. KCR staying at a safe distance from Congress is a judicious one, knowing what Congress has done to its partners. Even Yugpurush kejriwal did a vanishing act. This fraud of a person don’t want himself to be seen with corrupt politicians. His photo up with Lalu during the oath taking ceremony of Nitish Kumar didn’t go well with this false image of an anti-corruption crusader. He had to receive a lot of brickbats, quite rightfully so, for his hugging and kissing spree with Lalu. He don’t want to repeat the mistake again. But then, what would AK offer, even if he comes out and does his lap dance with other clowns of this ‘show of strength’ brigade later? Knowing his governance in Delhi, his party would lay a big egg like last time. His party’s prospects in Punjab isn’t bright either. Above all – what would happen to his false image of an anti-corruption crusader if he takes sides of these utterly corrupt individual and parties? But before everything - does this joker even relevant beyond the ecosystem operated TV studios and the pseudo secular cabal? And the most shameless and the most clueless among the lot is Rahul Gandhi and his mother Sonia Gandhi. Do I need to elaborate how adversely this duo would impact the coalition? They are already wiped out from everywhere and running fast to bankruptcy. Whatever little credibility they had as a national party, they shamelessly traded that in Karnataka by offering a bigger loser in Kumaraswami the CM’s post that he doesn’t deserve. That was some shamelessness beyond commonsense. more than the willingness of the Congress party to adjust politically the shameful saga of Karnataka exposed the desperation of the party. And I squarely blame the clueless mother-son duo for this mega fall of the party in credibility scale. That said, does Congress have any options left? My guess is as good as anybody's. As is, whenever Congress name pops up, it just makes me remember a crude Hindi proverb – “Nanga Nahayega Kya Aur Nichodega Kya”.